AllThingsDigitalMarketing Blog: #LoveTwitter - Twitter almost a teen; Reaches the BIG 012 on March 21st: Happy Tweet-Day to you (March 21, 2018) - Twitter thanks everyone for making history! 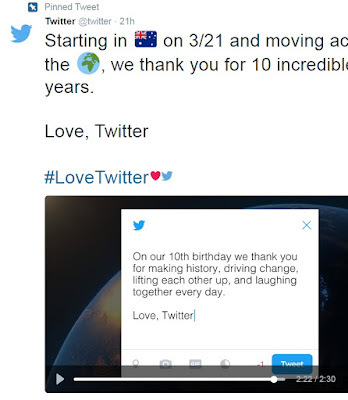 #LoveTwitter - Twitter almost a teen; Reaches the BIG 012 on March 21st: Happy Tweet-Day to you (March 21, 2018) - Twitter thanks everyone for making history! Happy Tweet Day Twitter! Below are screen captures of tweets taken from Twitter's big 010. Will update with Happy 12th tweet picks soon. 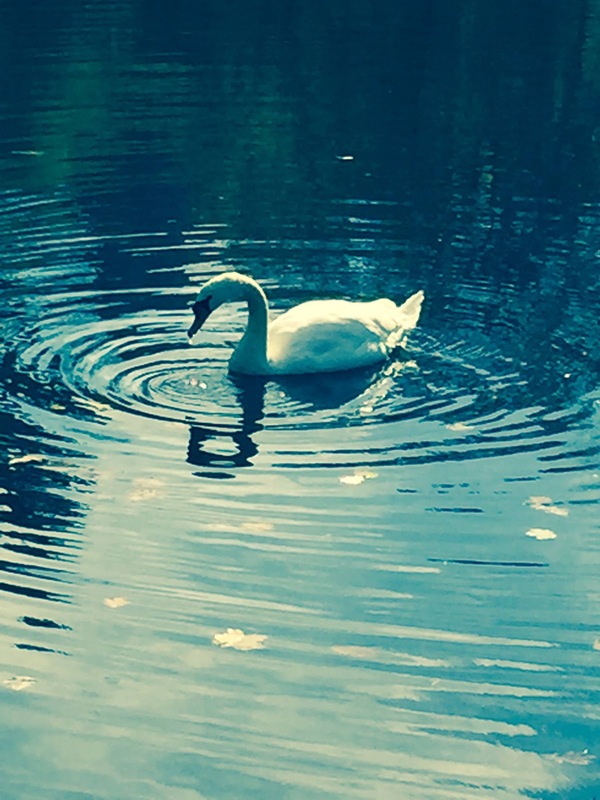 Below is the original article all about Twitter and the Ripple Effect from September 22, 2009. Enjoy and happy tweeting!! Did you know that the year 2017 marked the year Twitter would become major news and social? Also, the year when message size doubled to 280 characters for all languages (TechCrunch, 11/7/2017) except Japanese, Korean and Chinese languages. As of 216, Twitter had more than 319 million monthly active users (USA Today, 10/26/2017). During our 2016 U.S. presidential election, Twitter became the largest source of breaking news with a record-breaking 40 million election-related tweets sent by 10 p.m. (The New York Times, 11/8/2016). 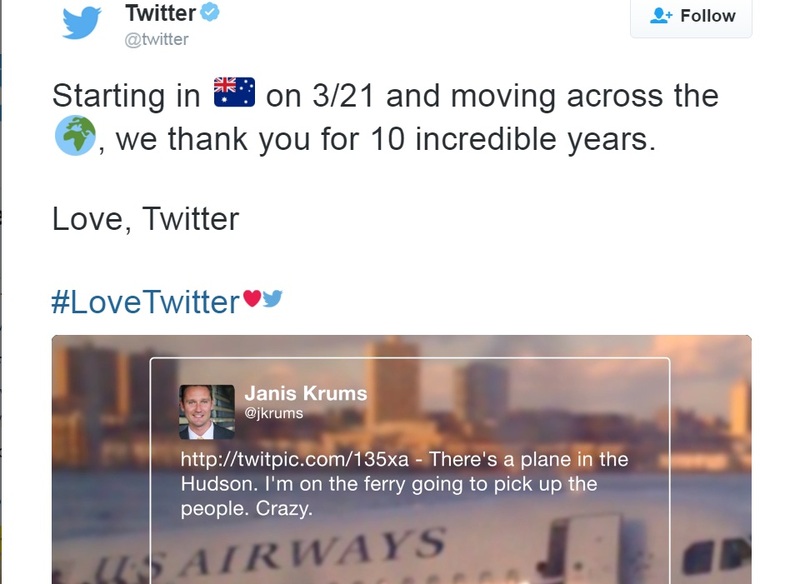 See Twitter's 10th Birthday video thanking everyone. 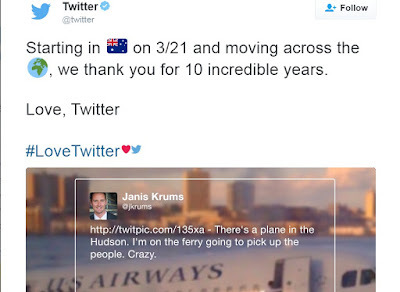 Twitter thanks everyone on it's 10th birthday for making history! Twitter has a very thoughtful and symbolic video celebrating 10th birthday. Still no definitive business model nor any $ profits yet Twitter continues to spread wings, ripple effects and much intrigue! Why can't politicians be like Twitter? Wishing TWITTER many more twitterers, tweets and TweetDays! According to Stan Schroeder, writer of Mashable, Twitter's B-Day is today -- last year I was wrong, I thought it was March 22nd, but it's indeed March 21st -- the first day co-founder Jack Dorsey tweeted his very first tweet. Here is Schroeder's article from Twitter's 6th (back in 2012), Happy 6th Birthday, Twitter! Twitter hasn't changed much with the exception of it's double size character limit, from 140 to 280, and itsphenomenal growth which is currently at 320 million users (February 2016), a usage increase of over 11% vs. last year and +60% increase in the amount of tweets per day. Last year Twitter recently reported they have 288 million active monthly users and 500 million tweets per day https://about.twitter.com/company. This year, according to DMR stats, Twitter sees 100 million users log in each day and as of February 10, 2016 there are 320 million people using twitterand 1.3 billion registered Twitter users. Surprisingly, less than 1/4th are U.S. (23% or 62 million), and over 3/4ths of these users (77% or 209 million) are outside the U.S. According to many resources including Mashable and SocialMedia, Twitter had about 200 million accounts a year ago (2014), and averaged 400M tweets per day. While this statistic may be debatable since others including Mashable indicate that Twitter has over 500 million, Twitter itself has reported that as of February 2013, they have 200 million users. Not surprisingly, 80% of Twitter active users (400 million) are mobile. Below is the original blog post written back on September 22, 2009 all about Twitter: Everything's the same except for the updated photo and of course the character-limit is now 280. "Twitter reaches the BIG ### today! Happy Tweet-Day to you!" is part of the "evergreen marketing insighter" series by Gloria Buono-Daly This blog is updated every year on Twitter's birthday and was originally written by Gloria Buono Daly (c) 2009.